A call to 26 North Yachts confirms the sale of the all-aluminium 25.9m motor yacht Speedy in an in-house deal. Speedy was built by Burger in 1999 to the exacting specifications of a long time boating couple who desired the best. Subsequent sea trials, with the objective of achieving maximum performance, were successful and Speedy is one of the fastest of the Burger 85s afloat. Twin Caterpillar 1400hp engines give her a cruising speed of 18 knots and accommodation is for six guests in three staterooms. 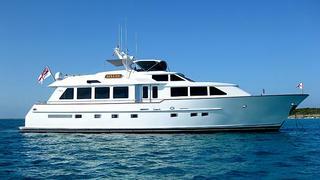 Refitted in 2011 Speedy was asking $2,895,000.